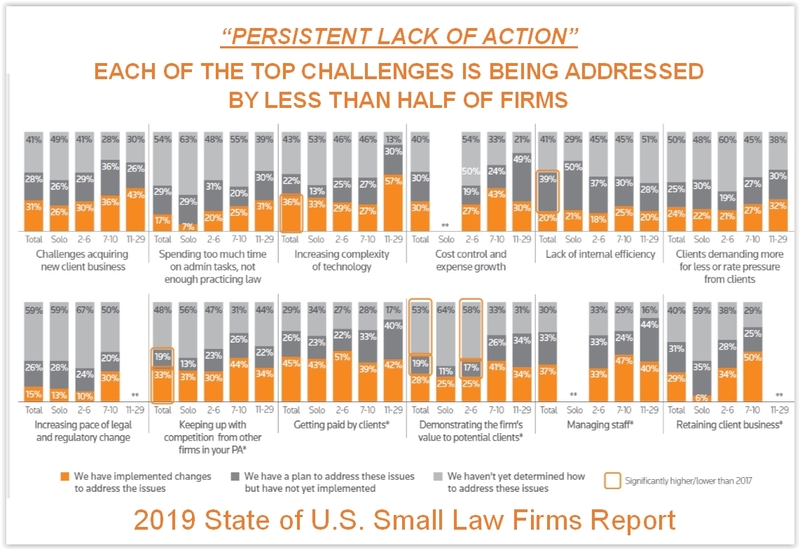 This is the third year TR has surveyed firms of 29 or fewer lawyers, and the results each year have been alarmingly consistent in showing that, while small firms recognize the challenges they face, they show surprisingly little movement in taking action to address them. This closely mirrors the findings of the last survey in 2017. Over the three years of the survey, the challenges small firms identify as their most significant have remained largely the same. As they were last year, their top challenges are acquiring new clients, time spent on administrative tasks, and the increasing complexity of technology. Yet when asked if they had implemented changes to address the challenges, those who had were in the minority, as the following chart shows. For example, three-quarters of firms (73 percent) say acquiring new business is a moderate or serious challenge, up from 69 percent two years earlier. But less than a third of firms (31 percent) have implemented plans to address the issue — a percentage that has hardly changed over the last two years. 45% of firms have adopted new technology. 27% have changed their marketing strategy. Fewer than 20% have changed staffing ratios, practice workflows, or billing practices. Why make changes? 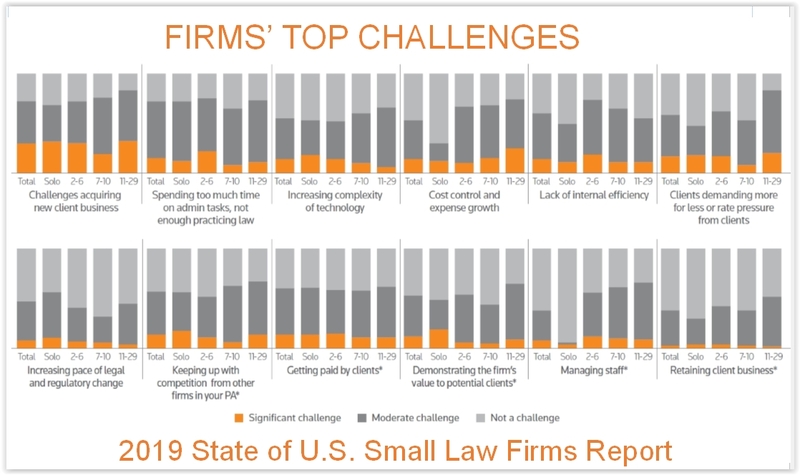 The top reasons given by lawyers in solo and small firms are to improve the quality of the services they offer, to respond to the overall legal climate, and to reduce cost. When asked about the technology they had adopted during the last 12 months, the most common overall was case/matter management, followed by time and billing, document drafting, and document management. Notably absent anywhere on these lists are artificial intelligence tools. A TR spokesperson said this is because AI is not a specific tool or solution, but an underlying technology. As it has done in past years, the survey asked small firms about how they measure success. And as in past years, the top measures are client satisfaction ratings and overall profits. Others include repeat business and work-life balance. Notably, among small firm lawyers, solos are most concerned about work-life balance. Yet a puzzling finding of the survey is that there is a disconnect between what firms say matter to them and what they measure. While 80 percent or more of every segment of small firms said that client satisfaction ratings were a key part of how they measure success, barely 40 percent actually track that metric. When small firms were asked where they are most likely to invest additional funds in the coming year, the top areas they listed were business development/marketing and technology/infrastructure. To the extent firms are making changes (or understand the need to do so), the primary motivators are to improve the quality of the services they offer, to respond to the overall legal climate, and to reduce their costs. 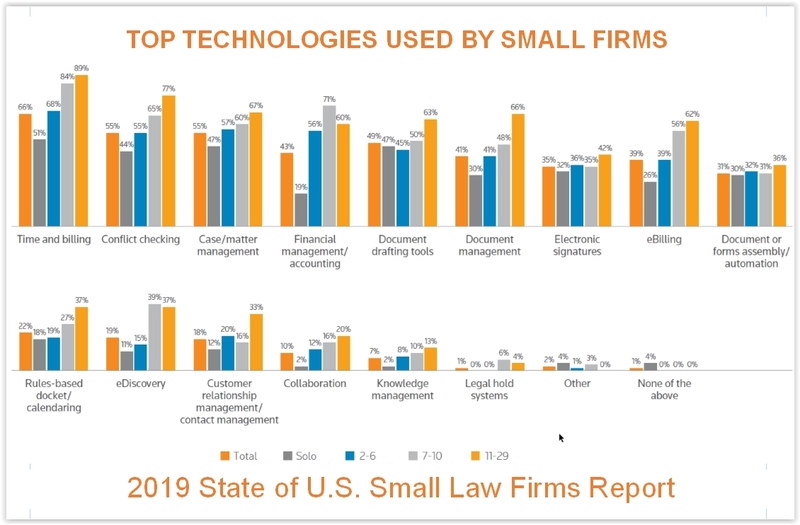 Small firms see their primary sources of competition as other firms of similar size and significantly larger firms that compete for the same clients. Relatively few see pro se consumers or do-it-yourself websites as primary sources of competition, although solos are the most likely to consider these as competitors. While this finding is consistent with the survey’s findings in past years, the survey’s authors say it seems to be at odds with the findings of another TR survey of of how consumers search for legal help. It found that only six in 10 potential clients even contact a legal professional, instead handling their matter pro se or through a DIY site. Also notable is that concern about DIY sites as competitors is down from last year, when 17 percent of respondents cited them as competition. This year, that fell to 12 percent. 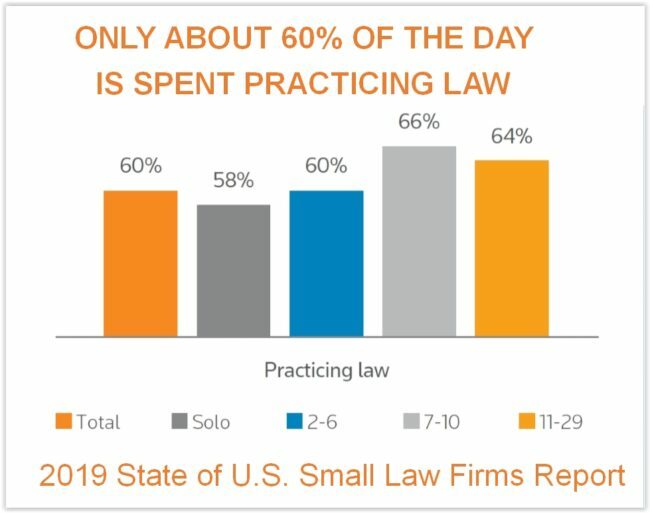 The survey underscored a fact that small firm lawyers well understand — that only a portion of their day goes to billable work. Overall, small firm lawyers spend 60 percent of a day doing legal work. The percentage is slightly lower for solos and slightly higher for those in larger firms. The remainder of a small-firm lawyer’s day is spent running the firm, managing finances, and going after clients. That means, the report says, that a lawyer working a 10-hour day will have, at best, only six hours for which they might eventually get paid. And most lawyers will tell you that it is highly unlikely that they will actually collect money from clients for each of those potentially billable hours. By the time the we account for leakage due to poor timekeeping practices, discounts and write-downs offered by the lawyer to address perceived client concerns, and client pushback on the final invoice, the proportion of each working day for which a lawyer will ultimately be paid dwindles quickly. This finding is more generous in its billable time allotment than that of the 2017 Clio Legal Trends Report, which found that lawyers spend only 2.3 hours, or 29 percent, of a workday on billable tasks. Exclusive: First Look At New Survey Of Solo And Small Firms. Solo and Small Firms Face Many Challenges, Survey Shows, But Few Have Made Changes to Address Them. This Week In Legal Tech: Exclusive Results Of A New Small-Firm Survey. Exclusive Survey Results: Small Firms’ Greatest Challenges And What They’re Doing To Address Them. More Exclusive Survey Results: How Small Law Firms Measure Success. 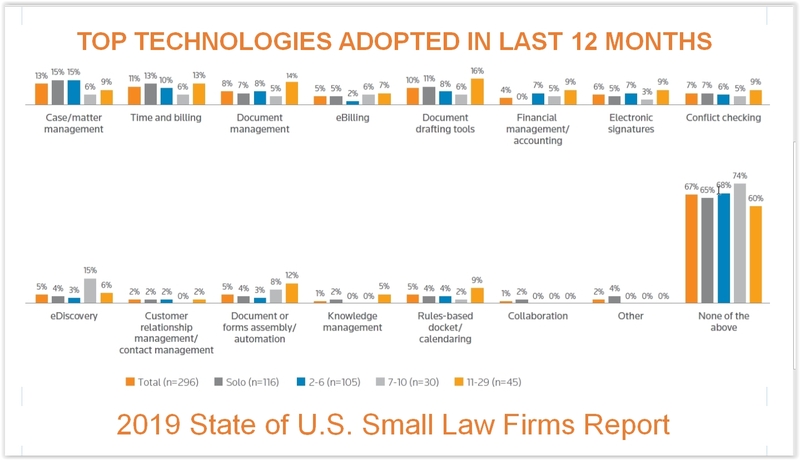 More Exclusive Survey Results: Few Small Firms Implementing New Technology. This Week In Legal Tech: Survey Sheds Light On How Solos Differ.